I suspect this whole session of finger pointing and rebel rousing is the final round to get all the blocks to decide something quick, or Mahdi will be booted. Merely another, and hopefully final round of "Hey! how about these guys?" Mahdi : "NO". Hey how about these guys?" Mahdi: "NO". What about these guys Mahdi?" " No! My choices for my ministry or I quit...." YADA YADA YADA. He's not going to quit, or he already would have...... They all love the power and the money too much! I agree with you NYK, but we ain't dealing with highly motivated individuals over there. This is a country that has a very large river running through it (which would be more dam building for them. (hopefully unlike the Mosul dam)....Yet they are still buying electricity from Iran.... Not exactly bright and focused over achievers. Who put him in charge????? Adam has been very quiet this week. Can't wait to hear his take on the latest developments!!! Well, on that note, I’m calling it a night all! Have a good evening! 6ly posted that pic without saying where it came from. Thought he was arguing it was An old bill from 1992. Mine isn’t... and it is identical... cept for the red on it. Oh yeah... and did anyone mention the colors being totally different, and I agree also the shape with the circles in it are different too Floridian. That doesn't like like the one from 1992....It doesn't have a picture of Hussein on it either... 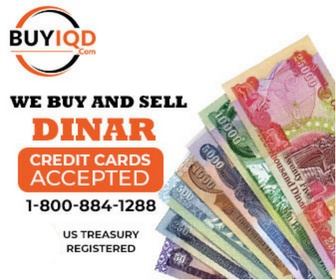 I am confused for sure now... "In 1991, 50 dinars were introduced and 100 dinars reintroduced, followed in 1995 by 250 dinar notes and 10,000 dinars notes in 2002. Banknotes that were issued between 1990 and October 2003, along with a 25-dinar note issued in 1986, bear an idealized engraving of former Iraqi President Saddam Hussein."